When I first decided to watch ‘The Fault in Our Stars,’ it wasn’t because I particularly wanted to, but because I figured it’d make for a good blog post. Then when I realized that it was harder than I had expected to take pictures of the movie screen, I thought I’d just give up on the movie altogether. However, when I tried to leave, I just couldn’t get my bottom off of the seat. Just like with the book, I found myself unable to stop watching. For some reason, I found myself addicted to the movie in the same way I was with the book. Still, I can’t say this isn’t a good thing. To put it plainly, the film was AMAZING. It was so amazing, I shouldn’t even be using a word as simple as amazing. The movie was breathtaking, staggering, prodigious! You know how it’s so very obvious when reading the book that the plot isn’t normal? Well, the movie really shows you that. That one scene where Hazel and Augustus talk about ‘An Imperial Affliction’ while Isaac breaks Augustus’s trophies against the wall…that scene cracked me up! As Holden Caulfield would say, “it killed me!” I loved all the crazy antics in the first half of the movie, but by the second half I was getting kind of bored…it was disappointing after the great start the movie had. On a side note, it’s crazy how though it’s a fact of life that books are always WAY better than movies, movies are beginning to catch up. So, I’m not sure if this is because I read the book already, but when Hazel first bumped into Augustus, I literally swooned. Thiswas surprising because I have a feeling that I just laughed at the cliché in the novel (of course, later I found out that the book was anything but cliché). Anyways, I ended up laughing even more during the afore-mentioned scene because what do you know, Augustus looks back at Hazel and ends up bumping into the door! I think I came home and replayed that part at least twice. And then the staring scene between the two…more laughter on my part. 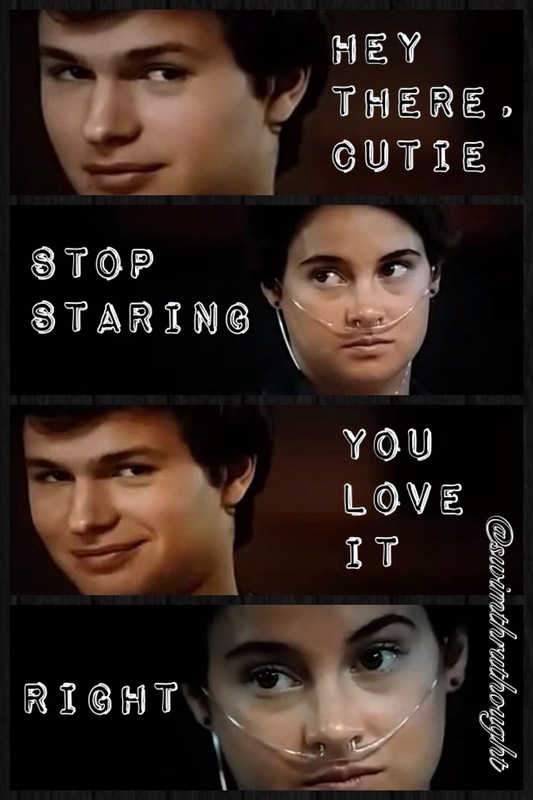 There were no words exchanged between the future lovers, but this picture to the left is literally what I heard in my head when watching the scene :’D Augustus and Hazel are adorable!! Despite how much I enjoyed watching this movie, it was a bit of a struggle to keep watching, especially around the 50 minute mark. Like I said, I’m not much of a YA contemporary romance gal, and I’m surprised I liked the movie/book at all, considering I don’t DO sad. One of my friends told me that my taste in books is “shallow”, but I feel the need to argue that romance is actually the opposite of shallow. Despite my picky tastes though, anyone who loved the book will devour the movie. I can say this confidently because while I myself eventually got kind of bored, everyone else was squealing and awwwing over the romantic moments. And there were a ton of them. Now…the sad part. It was worse than in the book. That whole ending was terrible! Tears were streaming down my face, and I had to wipe them off with my shirt since I was cocky enough to assume I wouldn’t cry. If you barely cried during the book, it is a FACT that you will cry during the movie. Why? Because the same thing happened to me. I guess seeing people in lieu of words just makes everything more real. If you haven’t gone to see the film yet, when you do, please do your shirt a favor and bring a few tissues (if not the whole box). Overall, this movie was more enjoyable than I’d expected (see ‘The Fault in Our Stars’ is Overhyped), but still too slow for my liking. It was a bit of a struggle to keep watching the movie at the halfway point, but by the ending – all the scenes after Hazel and Augustus’s trip to Amsterdam – the plot was heart-wrenching, and my eyes glued to the screen. I know this isn’t a movie I’ll be watching a second time, but I’m glad I took the time to watch it once, if only to sit here comparing it to the book. If I could change anything, in both the movie and the book, I would have the entire freaking torturous ending written as a happily ever after; I don’t care if it made for a better story, I can’t stand the unhappiness! Depression isn’t a side effect of cancer. Depression is a side effect of dying. You’re beautiful. I enjoy looking at beautiful people. Hazel Grace, I love when you talk medical to me. Do you want to talk about it?/No, I just wanna cry and play video games. Hazel Grace, he just called me sir! I’ve been trying to tell you I’m kind of awesome. Okay./Okay./Okay./Okay./Perhaps “okay” will be our always./Ok. I can’t believe I have a crush on a girl with such cliché wishes. (This one kind of stung lol, but whatever). So, you’re a survivor, huh?/ Yeah. Even got this fella (“this fella” referring to Augustus’s leg) off for the hell of it *smiles*. Is this where you take all your romantic conquests?/Yeah. That’s probably why I’m still a virgin. Ok…/Ok…/Enough! Stop flirting with me! We’re just friends./She is, I’m not. Enough of that. You don’t want to hear the sad quotes anyways; you’ll experience them (or you already have experienced them) during the movie. Instead, here are some scenes from the film, the film that is quite frankly, unforgettable. I’m actually just using the free hosting that comes with WordPress.com. I’m sorry I can’t help you more.